At the 2018 Consumer Electronics Show in Las Vegas, Intel detailed its latest efforts to build quantum and neuromorphic computing chips. The company unvelied Tangle Lake, a 49-qubit superconducting quantum test chip, and Loihi, a neuromorphic research chip. Both represent early steps, with Intel admitting that a lot of research still has to be done in both fields before they could become commercial products. “In the quest to deliver a commercially viable quantum computing system, it’s anyone’s game,” Mike Mayberry, corporate VP and MD of Intel Labs, said. Intel hopes to eventually build a complete quantum computing system, from architecture to algorithms to control electronics, with Tangle Lake representing initial progress towards this goal. The latest batch of silicon comes two months after delivery of a 17-qubit test chip. 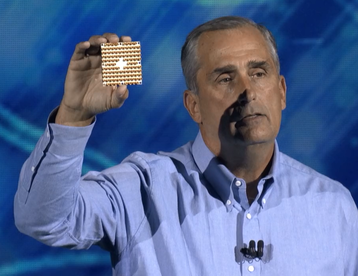 “This 49-qubit chip pushes beyond our ability to simulate and is a step towards quantum supremacy, a point at which quantum computers far and away surpass the world’s best supercomputers,” Intel CEO Brian Krzanich said during his CES keynote. The company also talked about its neuromorphic research chip, codenamed Loihi, which is meant to mimic basic operation of the brain. Intel plans to share the Loihi test chip with universities and research institutions in the first half of the year. Of course, there was a shadow hanging over Intel’s keynote - the major security flaw present in over a decade’s worth of its processors, that, to some extent, also impacted AMD, Arm and IBM. “Today is a day when we all come together to celebrate the lifeblood of our amazing industry – and that’s really about innovation. But before we start, I want to take a moment to thank the industry for coming together for another purpose – to address the recent security research findings reported as Meltdown and Spectre. The vulnerabilities were originally set to be officially revealed after the CES keynote, but were announced prematurely after media coverage.